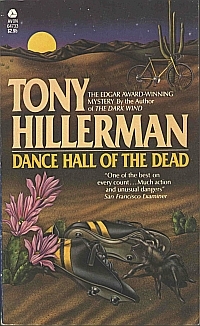 This is the second of two paperback editions of Dance Hall of the Dead printed in Canada. Avon released three other paperback covers for this novel the same year, 1975. This cover shows an illustration of nightfall over the desert, including a misplaced saguaro, an imaginatively blooming prickly pear cactus, and a tarantula spider. None of these elements are evocative of the novel's storyline, but the bicycle and the running cleats that also made it onto the cover are. Additional text announces "The Edgar Award-Winning Mystery by the author of The Dark Wind." The jacket designer is not attributed. Format: Paperback, 17.5 x 10.5 cm. Binding: Paperback with full color illustration on front and back covers.